Land and Sea Dept. that runs the restaurant Parson’s Chicken & Fish on Armitage Avenue is planning to expand come 2017. 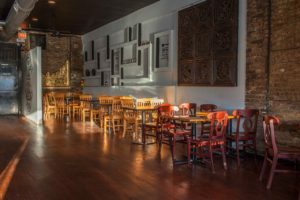 According to this story on DNAinfo, the expansion would mean a new bar, kitchen and more exterior seating. More news regarding the expansion is expected in the coming weeks. As 2016 draws to a close, Logan Square’s already bustling food scene opens its gracious arms to four new restaurants that will have more of the city’s population flocking to the hot and happening neighborhood. Find a list of the newcomers below and click to this article on LoganSquarist for more information. 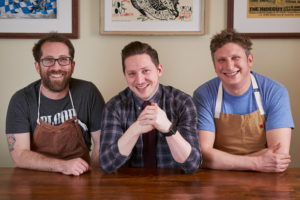 A new restaurant by the name of Giant is going to be opening soon in Logan Square that will serve “elevated Midwestern fare.” The 40-seat restaurant will be located at 3209 W Armitage Ave will be the labor of love and collaboration among Nightwood chefs Jason Vincent and Ben Lustbader who also worked at Lula Cafe together. Joining them will be Josh Perlman from Avec who will be coming on as Giant’s beverage director. They hope to open by the end of June. Read more about this story here by Paul Biasco. You can seriously, never have too many pizza joints, is what many people are probably thinking as they anticipate Paulie Gee’s new pizzeria opening in Chicago. 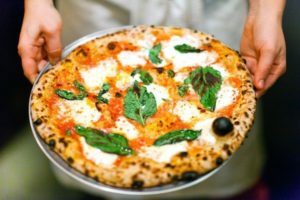 The restaurant is set to open at 2451 N Milwaukee Avenue, hopefully in June, and will be a Neopolitan-pizzeria with a full bar and will be able to seat about 100. The Brooklyn-based pizzeria will have 17 different kind of regular pizza on the menu as well as 6 vegan-style pizzas. Read more about this story here by Paul Biasco. Chicago’s only Malaysian restaurant, Seari, which is located in Logan Square, is getting some love from the Hungry Hound this month as it brings it’s celebration of Asian American Pacific Islander Heritage month to a close. Serai brings a fusion of flavors to the plate including Indian, Southeast Asian and Chinese with it’s fried rice, curry, and pickled eggs. Read the entire story by Steve Dolinsky here. Johnny’s Grill, New Best Burger Joint? 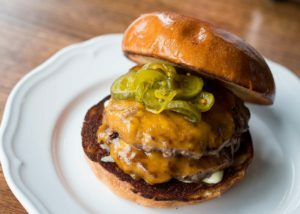 There are a lot of great burger joints in Chicago; from Au Cheval to Kumas Corner. A reporter for the Tribune; Marissa Conrad, thinks differently. Johnny’s Grill in Logan Square, which was taken up a notch when chef Sarah Jordan took over, has a cheeseburger with two thin griddled patties that have her swooning. If you can find a good burger that doesn’t make you want to eat your arm or shoe while waiting in line, that is all the better! What are some of your favorite hidden burger spots in the city?